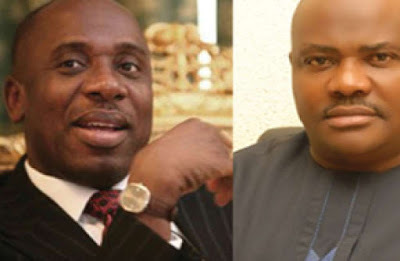 Rivers State Governor, Nyesom Ezenwo Wike has declared that President Muhammadu Buhari will fully support his fight against the massive corruption that characterised the administration of the immediate past administration of Mr Chibuike Amaechi. Speaking after receiving the final report of the Transition Committee of his administration on Friday, Nyesom Ezenwo Wike said that his administration is committed to recovering all funds diverted into private pockets by officials of the outgone administration. He said : " I am confident that President Muhammadu Buhari will support my administration in the quest to tackle the massive corruption that characterised the Amaechi administration. "We are aware that the immediate past administration and her officials will resort to blackmail and propaganda for the purpose of diverting attention from their corruption practices. We shall remain focused on the task of getting back Rivers State resources and assets ". The governor commended the Transition Committee for a job well done, saying that the committee's interim report helped his administration to take off. Submitting the final report of the Transition Committee, former Deputy Governor, Tele Ikuru described the Amaechi’s administration as the most corrupt in the state's history. Ikuru said that the former governor expended N812million to furnish his personal residence at the expense of the state, while N4.96b was spent on Justice Karibi White hospital with no structure on ground.